Nearing the end of the pictures in the Spring book, with four to go, it already feels like Summer outside (occasionally...). Spring picture 21 is like a picture from a child’s fantasy of Spring, with a mare and her foal, blossom, chicks and orchids. 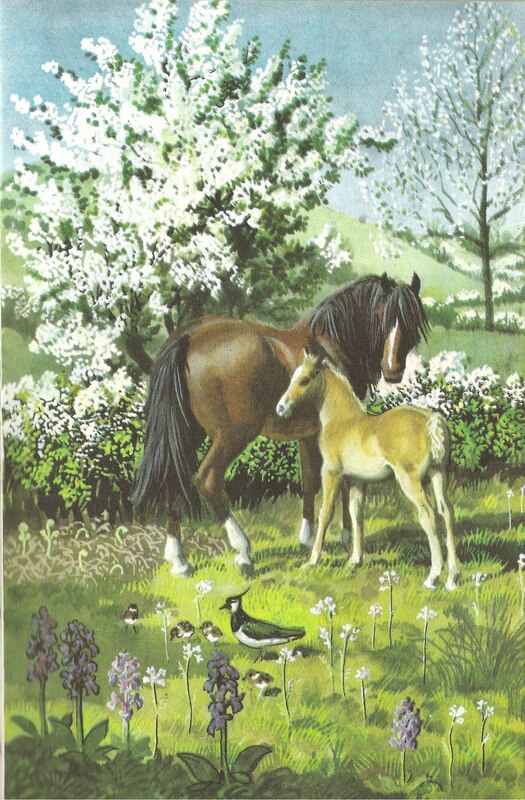 In fact, the text of the book is charming: “The mare and her foal are in a lovely place on a lovely day, and have the best month of the year in which to stray at their own sweet will.” But horses aside, the wilder, natural elements of this picture are a lapwing and her chicks in a field where the bracken is growing up among the flowers of early purple orchids and lady’s smock. To complete the picture, a hawthorn tree in the hedge of the field is in full blossom and, in the background, the new, silvery, pale leaves of a whitebeam tree are opening. I already covered the long-term problems of the lapwing or peewit (Vanellus vanellus) in a previous post in the series but with the beautiful lapwing chicks in the picture here, how could I not add a bit more? 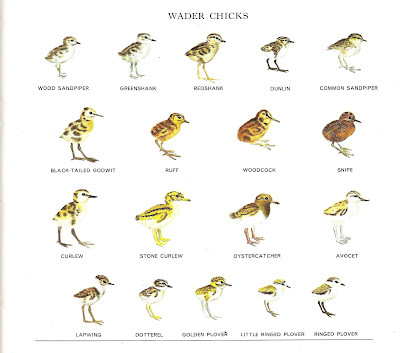 I just wanted to share the following picture, scanned in from my beloved old AA Book of Birds (from 1969), which is just possibly the cutest bird picture ever painted – not my dispassionate contribution to the assessment of the state of nature, but who cares? Everyone deserves to see and enjoy this en masse set of wading bird chicks! The lapwing chick is bottom left. If you double-click on the picture, you can take a closer look. The bracken fronds starting to rise behind the mare first appear as little spiralling “fiddleheads” uncurling from the ground, but fairly quickly they will shoot up to form a dense green canopy. Bracken (Pteridium aquilinum) is a native species of fern found in the uplands, on moorland, in forests, generally on slightly more acidic soils. Many land managers regard bracken as a problem invasive species, which can invade and ruin good grazing land. In keeping with that attitude, the New Atlas of the British and Irish Flora identifies that its abundance increased markedly in the 20th century, “apparently in response to more intensive sheep grazing and more frequent burning of hill vegetation. In the 1970s, it was invading more than 10,000 hectares of agricultural land annually.” But, if you looked only at the records of bracken in Britain divided up by squares of sides of length 10 km in 1962, you wouldn’t see this, as it was recorded nearly everywhere even then. So what has happened is that its local distribution has increased in many areas. This shows the importance of understanding exactly what it is that records of nature are telling you. Looking at the trends in species in more than one way can reveal changes which would be masked by looking just at, for example, records as presence or absence in 10-km squares. But bracken hasn’t always been a villain – it has a long an honourable history of use in rural Britain, as described by Richard Mabey in his “Flora Britannica”, including manuring and covering potato beds, for dressing leather, and as fuel and tinder. Chiefly, however, it was used as “a universal packing and padding stuff”, such as winter bedding for cattle, basket lining for fruit and fish, and padding for earthen ware and slate transport. Mabey also suggests that the decline its use as modern alternative materials became available, may have contributed to its spread. In 1990, it was estimated that bracken covered between 1.2 and 1.7% of Britain’s land area, and 15% of rough upland grazings, leading to more grazing of bracken by stock – this may be a problem as it is toxic to mammals and may be carcinogenic to humans if overeaten (the young shoots are commonly eaten in east Asia) and perhaps from over-inhalation of its spores. One to watch! You will find fewer people complaining about the presence of native orchid species on their land, and we see the flowers of the early-purple orchid (Latin name: Orchis mascula). The New Atlas reports that this orchid, which grows on a variety of neutral and calcareous soils, is most common in “woodlands, coppices, and calcareous grassland”, as well as in hedgerows, scrub, roadsides and railway banks, on limestone pavements and moist cliff ledges. The fact that this species has, since 1962, declined particularly in central England and parts of Scotland, is largely due to felling of woodland or its replanting as conifer plantations, the intensification of grassland management and ploughing. Richard Mabey makes an interesting point – the variety of local names for this species (perhaps over 90) suggests that the early-purple orchid was once abundant and well-known. Mabey also adds that the habitats where it is found includes “precisely the kind of habitats that have suffered most from development and modern farming over the past 50 years [the precise window for this series of posts, as it happens], and where they have gone the orchid has usually vanished with them”. Maybe the early-purple orchid ought to become one of a number of flagship indicator species of the success or failure of our future efforts to prevent further declines in our native wildlife. Fin ally, the Latin name Orchis that is applied to many orchid species (such as this one) is the Latin word for “testicle”, due to the testicle-like pair of root-tubers from which orchids grow! The other flower growing in the horse’s paddock is the cuckoo-flower, or lady’s smock (Cardamine pratensis), a perennial herb typically of wet grassy areas in woodland, wet meadows and fens, upland rush pasture and springs. I think it is the main food plant for the caterpillars of the beautiful Orange-tip fritillary butterfly. There has been no overall change in its distribution since 1962. According to the New Atlas, it is quite resistant to some herbicides and so has been able to survive in semi-improved pastures. Regarding its superstitious status, Mabey suggests that, among other possible causes, the red berries and thorns was taken, in earlier times, as an association with the Crucifixion of Christian tradition. On the wild food front, we eat the new young leaves in salads in Spring, which taste slightly nutty. The New Atlas indicates that its distribution is stable. As it has been so widely planted as a hedging plant for centuries, however, the extent of its natural distribution is unclear, although in northern Scotland, its distribution is often confined to the vicinity of habitation where it is almost certainly an introduction. Briefly, the whitebeam (Sorbus aria) which is coming into leaf in the rear right of the picture, is a small-to-medium sized tree, not native to Scotland (in fact, probably only native to southern England. The New Atlas reports its distribution as stable, although widely planted, including in Scotland, in parks, gardens and streets. The new leaves of this tree resemble the buds of magnolias before they open and, with fine downy white underside and shiny slightly silvery leaf-top, must be the whitest-looking leaves of any tree native to Britain. I’ve been greatly enjoying their emergence every morning this Spring along our local park and golf course footpaths. One unusual feature of the whitebeam is its tendency to form highly-local endemic species often confined, according to Flora Britannica, to single rocky gorges and found nowhere else in the world. 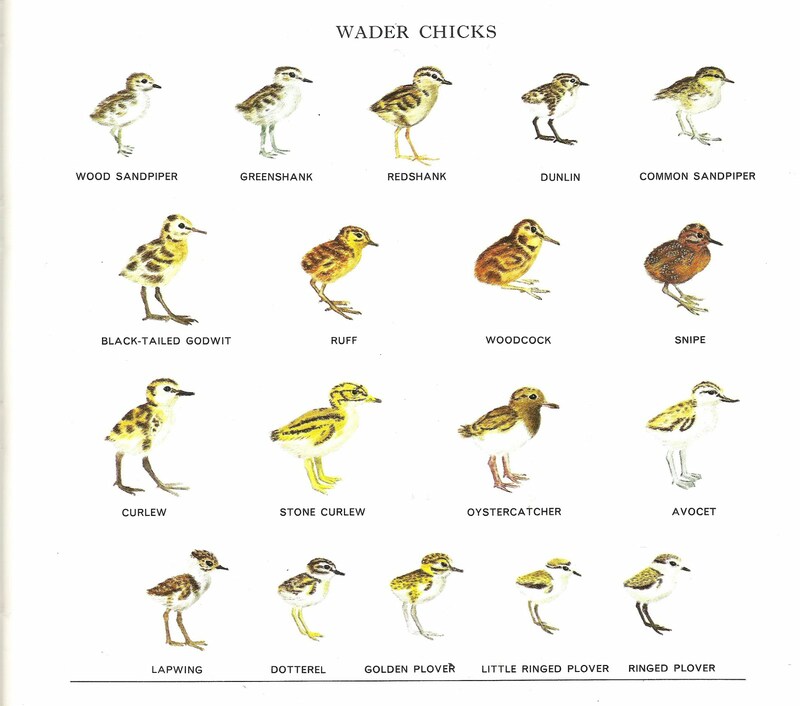 At least 14 of these individual species are known in Britain. Special! What a lot here. We have lady's smock in abundance in the garden (also known as cuckoo flower I think). It has finished flowering now, as has the hawthorn. Our whitebeams are just finishing flowering. I haven't seen a purple orchid since I was a child. Bracken is being used to make a peat free compost somewhere in UK - I think it might be called Lakeland Gold or some such. Re wild food, hawthorn berries make a very good jelly, but you need a lot of them as they are dry. Same principle as rowan jelly. @katepang - what a lot of useful feedback! I've tried to find the bracken compost (the name sounds right) for sale around here, but no joy. A couple of years ago, we used hawthorn berries to try to make a kind of turkish delight but it was a bit dry and unsuccessful. I think the berries were too dry to start with. @ian - you are quite right - there are actually genetically quite distinct individual whitebeam tree subspecies on Arran. If I'd known about this link: http://en.wikipedia.org/wiki/Arran_Whitebeams before I finished the post, I'd have added it in!